OceanPath Fellowship, a yearlong program coordinated by Coady International Institute and funded by the Pathy Family Foundation, makes Kishore’s work possible. 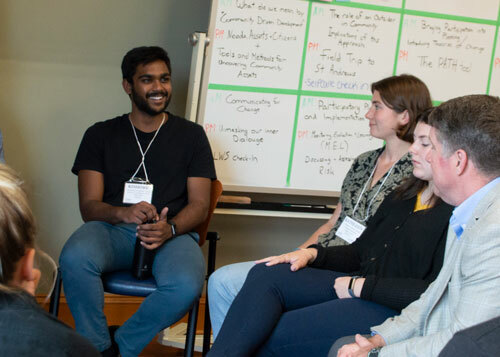 The fellowship provides community-focused experiential learning opportunities for exceptional young leaders to become active and effective change-makers, bringing new ideas and working closely with communities to foster sustainable and positive social change in Canada and around the world. After completing introductory courses and project planning phases, fellows embark on a nine-month community phase where they lead the implementation of an initiative they have designed in partnership with a local community. While private schools are common in India, many rely on public schools as a way to serve under-privileged children. There is a strong belief among parents that public education is of a lower quality. This drives those who can afford private schools to leave the public education system, leaving it underfunded and declining in quality. Kishore’s initiative focuses on curriculum reform with a focus on skill-oriented teaching. He is also helping to train government officials and teachers on data reporting so that they can measure student outcomes more effectively, and adjust lesson plans accordingly. Now eight months into the project, Kishore’s initiative has already had far-reaching impacts, through partnerships with 12 schools – serving more than 900 students – and the future looks even brighter. The growing partnership with the government of Tamil Nadu, a state with a population of more than 72 million, will enable Kishore and Chudar to reach schools across the state, and they have plans for immediate expansion including participation from approximately 100 more schools. As Kishore reaches each project milestone, he is learning that flexibility is sometimes necessary when it comes to turning a vision into reality. 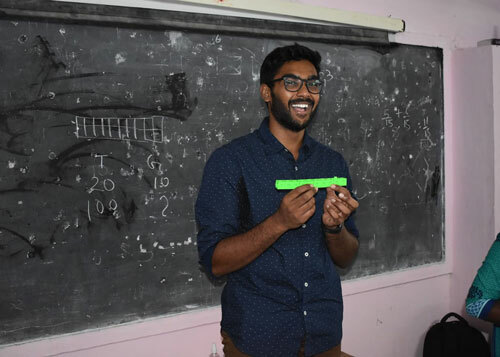 “[When] we discussed the next pillar of the fellowship, we realized that my background and scope of understanding of the people within the community was a big limiting factor to carrying out the proposed research,” Kishore says. After consultation with the organization and members of the community, the group was able to redefine the next steps. Kishore says that although you can adjust your plan as it unfolds, it is important to be mindful of where you started and stay true to your original objectives. “My ‘north-star’ of children learning better is something that I have derived from Chudar’s mission and so, this is something that is fundamentally at the heart of every initiative that happens here,” Kishore says. “I constantly remind myself of this whenever I am pursuing new projects. The training and ongoing support provided by Coady have been instrumental in the success of his initiative. He says that the fellowship experience has been “nothing short of transformational in my own personal journey. Kishore says the organization plans to continue many of the new initiatives after the fellowship ends; his work has helped establish a solid foundation for future positive impacts at ever-greater scales. For more information on the OceanPath Fellowship, visit oceanpathfellows.com. For more Coady educational programming, visit coady.stfx.ca.